Join us at the 9th annual GWIL Conference on April 26th, 2019! Learn more and register here! We are gearing up for our Annual Conference!!! Alumnae, students and friends are the heart of this unique program which inspires women in their personal and professional leadership. Together, we create a community where we can connect, learn, mentor and teach each other - and the next generation of women leaders. We host a variety of alumni networking and educational events in the twin cities, student events on campus, a three day GWIL Student Scholar Business Bootcamp, and the grand finale Gustavus Women in Leadership Conference. How do we develop Gustie Leaders? We are a student and volunteer led organization, the students are chosen by board members through an interview process. Then, we divide out the responsibilities into committees in order to make the organization run smoothly throughout the year. Each student(s) team up with their respective board members to meet their committees goals. The students work cross functionally with each other (and the board members,) lead weekly meetings, and organize events and the conference. Students are able to get experience running an organization in a business like setting which gives them great experience for internships and future jobs. Location: Sheraton Bloomington Hotel, 5601 W 78th St, Minneapolis, MN 55439. Enhance your skills to be more effective in your professional and personal life and hear Tina’s personal journey of overcoming the fear of change, resiliency, asking for help, and the importance of gratitude. A media and public relations professional panel that included Maria Reitan, former Emmy Award-winning news director and Erin Mathe, former news anchor discussed the ethics and influence of today’s media climate. A lively discussion was led by Pastor Susan (Lindy) Purdy '70 to sharpen attendees communication skills across age, gender, ethnic, and political differences. GWIL membership program was launched over cocktails and networking on the terrace of the Calhoun Beach Club. Learn more about GWIL events or contact us at gwil@gustavus.edu. 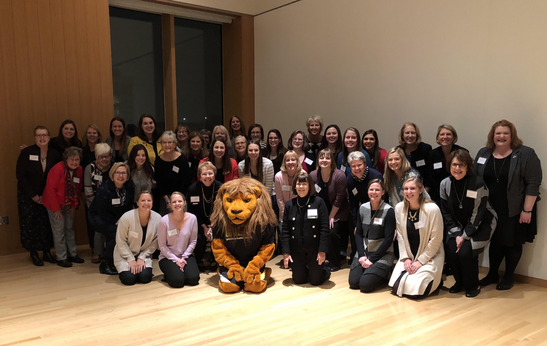 Sponsorships offer an opportunity to support the work of Gustavus Women in Leadership, develop market awareness among hundreds of professional women, and mentor and connect with scores of talented students each year. *You may choose to waive the sponsorship benefits so 100% of your gift will go to GWIL.